embroiderers, jewellers, medical, clinics, lessened vision, eye sight impaired. 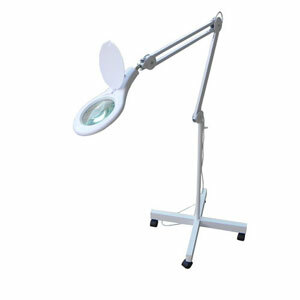 CAPG009W Floor Magnifier Lamp on sturdy Stand. Fully outstretched arm length is approximately 1.2 metres. CAPG002B Black model on mobile Stand with 22 watt Light. Fitted with a 5 dioptre Glass Lens. CAPG004W Floor Magnifier Lamp. Fully outstretched arm length is approximately 1.22 metres. CAPG005 Portable white Table Lamps. Fitted with 12 watt Bulb and Glass Lens. These Lights are ideal where space is limited. CAPG005 Portable Table Lamps with 60 LED Lights. CAPG006B Bench Light with Clamp - Black gooseneck model with 5 dioptre Lens and 22 watt Fluorescent Bulb. CAPG008B Magnification lens with Lighting - Suitable for use as a Table Lamp as well as being mounted on a Wall or mobile Stand. CAPG008W Magnification lens with Light - Suitable for use as a Table Lamp. CAPG010 Table Lamps with bright 28 watt Lighting. Has a built in 5 dioptre (2.25 times) lens plus a removable additional small 12 dioptre (4 times) lens. CAPG012W with two 9 watt Lights - one on opposite sides of the lens. CAPG040 5 dioptre Magnifiers with large lens surrounded by 108 Lights (LED diodes). CAPG041 Floor Lamps with 108 Lights (LED diodes). CAPG070 Professional Desk Lamp - adjust to any position. This Magnifier has a heavy base for stability, round 5 dioptre Glass Lens and 22 watt Fluorescent Bulb - A great Table based model. CAPG090 Table Lamps with 90 LED Lights and round 5 dioptre Glass Lens plus removable cover. Fully outstretched arm length is approximately 1.2 metres. Can also be mounted on a wall or mobile stand. Since its introduction its been our best selling LED Light. CAPG001WL Replacement round lens with 5 dioptre Magnification. CAPG003WL Replacement rectangle lens with 5 dioptre Magnification. CAPG005L 12 watt Light Bulb. CAPG030W Sturdy white mobile Stand with 5 legs. CAPG031B Black mobile Stand for Floor Lamp. CAPG031W White mobile Stand for Floor Lamp. CAPG051B Large Bracket - black. CAPG051W Large Bracket - white. CAPG053 9 watt Light Bulb. CAPG053A 9 watt Light Bulb. CAPG054 22 watt Light Bulb. CAPG056 28 watt Light Bulb. CAPG057B Black Bench mount for Light. CAPG057W White Bench mount for Table Lamp. Delivery available of any Magnifying Lamp Australia wide. Payments accepted online for PayPal, MasterCard, Visa. Have any questions, the call on (02) 6162 1950 or email us. * Clamp fixed, Bench top and Pedestal Light models available. * Our full range of Light demo models plus fixtures can be examined in our store in Canberra.